Continuing east through Yuba County we crossed several steel bridges, concrete slab bridges, and over the majestic Bullards Bar Dam but it seemed like the most interesting bridges were along the county's borders. Everything in this part of Yuba County is called Oregon Creek including this covered bridge. We are near South San Juan where the famous 'Beat' poet Gary Snyder lives, which perhaps explains why the area resembles a hippie commune. When I started to photograph this bridge a young man came out of his bus and said he was parking in front of the bridge because he was recharging his solar cells. Fortunately, the other end of the bridge remained unobstructed. 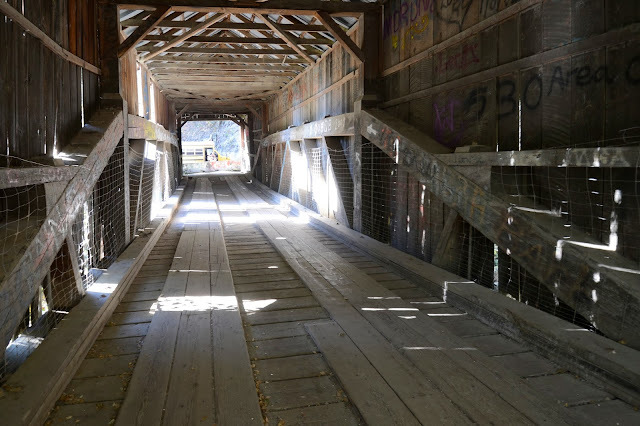 The Oregon Creek Covered Bridge (16C0017) was financed by Thomas Freeman in 1860 to carry silver from the Comstock Mines into California. It was built by Hugh Thomas and registered as a National Historical Place in 1975. It's 101 ft long, 12 ft wide, and supported by a Queenpost timber through truss. It was carried off its foundations by floods several times and is currently closed to traffic. Yuba County, California Bridges: Oregon Creek Covered Bridge by Mark Yashinsky is licensed under a Creative Commons Attribution-NonCommercial-NoDerivs 3.0 Unported License.